Super-simple, super-delicious dish that parents and kids will love! 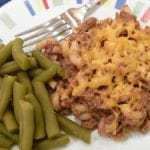 Mix all the ingredients in a microwavable 9x9 dish or a large casserole dish. Microwave (uncovered) for 8 minutes on high. Stir really well and microwave on high for another 8-10 minutes (time may vary a bit, depending on your microwave) until liquid is mostly absorbed and the macaroni is soft. Let sit for 5-10 minutes before serving and cover with your favorite cheese (slices of American or shredded cheddar work well). You can mix in a veggie if you want, such as peas or cut green beans!